Historically, they resided on Cochiti Pueblo, San Felipe Pueblo, Santo Domingo Pueblo, Zia Pueblo, and Santa Ana Pueblo. 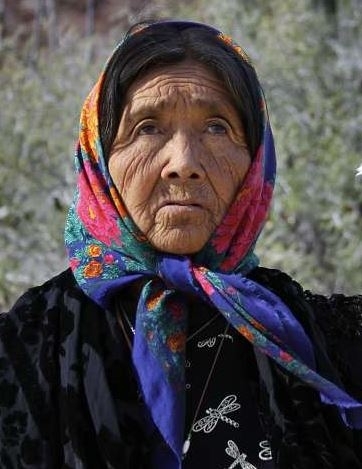 The Eastern Keres Pueblo are a Native American people and a dialect cluster spoken by the Keres Pueblo people north of Albuquerque, New Mexico. Many of the Pueblos are located where the Spaniards first contacted them in the sixteenth century. The Keres language consists of seven Pueblos divided into two dialect subgroups. The two dialect subgroups include the people of the seven pueblos of Acoma, Cochiti, Laguna, San Felipe, Santa Ana, Santo Domingo, and Zia. Western Keres and Eastern Keres subgroup dialects are significantly different and are basically two different languages. The majority of Eastern Keres still speak Keres at home. The Eastern Keres Pueblos include the Cochiti, San Felipe, Santa Ana, Santo Domingo, and Zia. Although the word pueblo is the Spanish word for "town" or "village", it actually comes from the Latin root word populus meaning "people". The Pueblos are not specific to a town but an area. See each Pueblo link above for its geographical size. The Keresan Pueblos, both Western and Eastern, practice a blend of their native religious practices and beliefs and those of Roman Catholicism. Some Protestants are present, but they have remained relatively insignificant in the overall religious picture. For more information, visit the Indian Pueblo Cultural Center website. Pray that God will work through dreams and others means to reveal truth found in Jesus Christ. Pray that God will send Christians to share a relevant and contextualized gospel message in word and deed.